Nike Skateboarding has proven they’re the best for graphic-inspired releases on their classic Nike SB silhouettes. 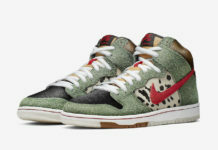 Now, we take a look at their latest Nike SB Dunk High PRM Picnic colorway that just may leave you a bit itchy. This Nike SB Dunk High features a full Red and White picnic blanket upper that is covered with ants stitched throughout the panels looking for leftover food. The shoe is completed with a clean White rubber outsole and also comes with an extra set of Red laces. Perfect for summer picnics, you can now find this Nike SB Dunk High PRM Picnic colorway available now at select Nike SB retail stores, including shops like Premier. The retail price tag is set at $100 USD.